Aims: To extend our community service programmes to an international level. The team is charged to identify, review and recommend projects in less developed countries of the world and to progress adopted projects through to completion on behalf of the club. We often work in partnership with a Rotary Club near the area to be supported and take advantage of matching grants from Rotary Foundation. In 2017 to date we have again supported the LEAP INDIA CHARITY. This Charity is currently supporting 50 children and students. Both the residential and educational facilities at the boys' home needed improving. The educational facilities are also used by the girls. Purchase of beds and mattresses, study tables and chairs, projector, air coolers and window shutters. Along with the Gerrards Cross Club and a District Grant we provided some £3800 to buy IT equipment for in-house education. Six PCs and associated equipment were funded. Below we see some details of the usage of the computers and the playground of the orphanage. 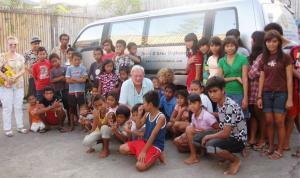 In 2012 and 2013 Misbourne Matins formed a working relationship with the Rotary Club of Canggu based near the capital Denpasar. This has resulted in collaboration to help the local community in this needy part of Indonesia. Whilst Bali has a large tourist presence, the local population does not benefit from many things which we take for granted and we are pleased to be able to help them improve the delivery of healthcare, personal hygiene and education facilities. Our member, Judy Goldie, has strong ties with Bali and the Rotary Club of Canggu and is seen here handing over our funding of the Wanagiri project. In 2004 the Club was made aware of Rotarians in South Africa who had founded and supported a hospice for both cancer and HIV/Aids sufferers. Our Club helped to provide vehicles to the hospice in 2004 and 2007. 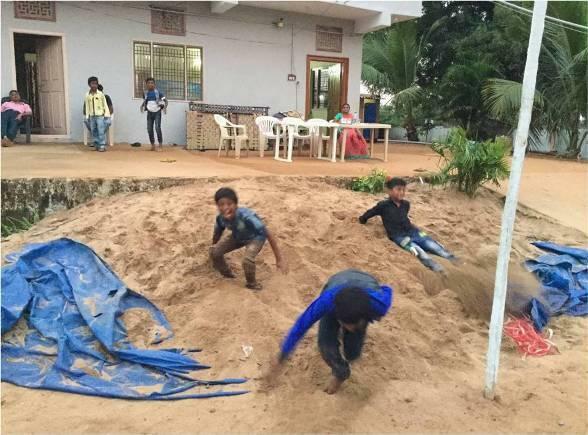 A club member on holiday in Goa went to a local Rotary meeting and was asked if Misbourne Matins would join with Indian clubs in providing clean drinking water to schools. 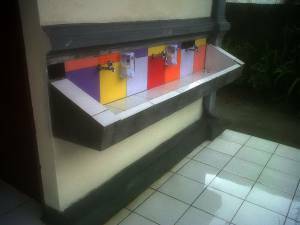 Seventeen schools and some 20,000 children were provided with clean drinking water through this project. The club chose cataract surgeries for their 2011-12 international project. These were jointly funded with the Rotary Club of Belgaum North, Belgaum being a city 100Km inland from Goa and 500km south of Mumbai. Grants were also obtained from the Rotary Foundation enabling over 800 cataract operations to take place at a series of eye camps at different locations around the city. For just US$30 each, a simple 15-minute cataract operation can restore sight to some of the many blind people in India. The benefits go far beyond the individuals quality of life. It means they can play a full and active role in their family, their community and the wider economy. 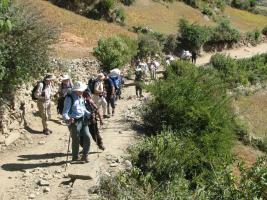 The Nepal Trust is a Scottish-based charity working exclusively in North West Nepal providing assistance to villages up to 5,000m in the Himalayan foothills. Their main aims are provision of electricity via micro hydro-electric schemes and the lighting of village houses through solar panels. Click here to read a report on the assistance given. A club member is also a member of a club in Bali and suggested an Orphanage as a candidate for assistance. The orphanage required a vehicle to transport children to school, on trips and, occasionally, to hospital. Click here to see video of Children of the Orphanage thanking Rotary after delivery of the new bus. 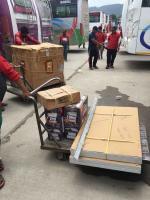 Misbourne Matins actively participates in both these programmes, which are designed to be available and ready for despatch in response to calls for relief aid in areas struck by natural disaster. For example, shelterboxes provided by our club have been sent to Iraq, Tsunami Relief and Kashmir (2).